Simply the best tasting pork! It may seem odd to use rare heritage breed pigs for pork, but these breeds simply will not survive unless a market for these animals can be created. 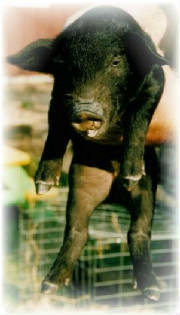 Already 6 of the 15 breeds of pigs raised in the United States in the 1930s are extinct. The other white meat"? That's not the way we think of pork, and after you taste Mulefoot pork, you won't either. The flavor? According to Florence Fabricant of the New York Times, heritage pork is "darker, more heavily marbled with fat, juicier and richer-tasting than most pork, and perfect for grilling." "the meat is very tender, very tasty, just very good pork," . "It is the quantity and quality of fat in heritage breeds of hogs that give the meat its superior flavor when compared to modern breeds that have been bred to produce extremely lean meat." The meat is a rich Beefy color, unlike the anemic color of factory farmed pork. Factory farms breed pigs to produce the greatest amount of meat for the lowest cost, regardless of the need for genetic diversity or the quality of the meat. The resulting product is a standard size, color, and flavor, however dull that may be. Pork from heritage breeds is more moist and has a better flavor and texture than the pork from conventional hybrids.When pasture-raised meat is good, it's unforgettable. Mulefoot pork is freckled with marbling and is red like beef. The meat is dense but not tough and the fat melts slowly, so when you're braising, it takes hours for it to soften, and as it cooks, the fat keeps bathing the meat, making it silky. You can also cook this pork simply--grilling or roasting it, for instance. It melts in your mouth like butter. There's no need to infuse it with extra fat and flavor, which is necessary with commercial pork." It usually does cost a bit more to buy meat from heritage breeds, but there are good reasons for the higher price tag: Heritage breeds take longer to reach market weight than conventional breeds, and because they also produce a higher percentage of body fat, fewer of those pounds consist of marketable cuts.The high quality and great flavor of the meat nevertheless creates steady demand from customers willing to pay the premium. "At last, pork that doesn't taste as though it has been on a low-fat diet!" Their simply is no comparison... it tastes marvelous! Bringing heritage foods to homes and tables is not an easy task but the effects are far reaching. We hope to help sustain small independent family farms by increasing their revenues; to save our rare breed of swine currently at risk of extinction by expanding their markets; to be a catalyst for supply of this rare breed heritage pork and breeding stock; and to bring great tasting food to your door for special occasions. Heritage pork has such good flavor it is being offered in many restaurants accross the country. Demand for this high quality pork far outweighs supply.